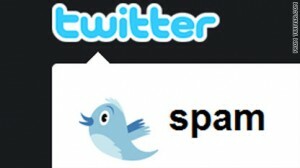 Have you noticed that brand new Twitter spammer accounts don’t show any tweets? I’ve been noticing that in spam accounts for a while now because that seems curious to me. 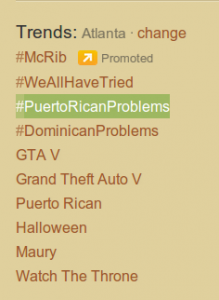 Then I noticed that #dominicanproblems was trending – and not just in Dallas Ft. Worth – for the entire United States and large numbers of individual U.S. cities too. 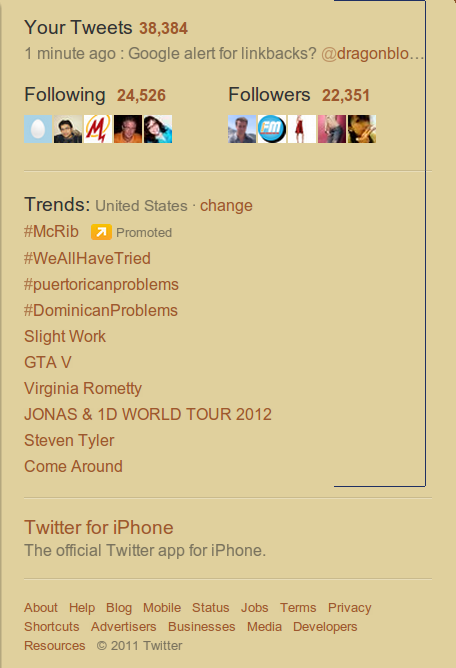 There were an unusually large number of spam tweets promoting Visa. So I did these screen captures. This post is long because of the images, but you can quickly scroll through them all. 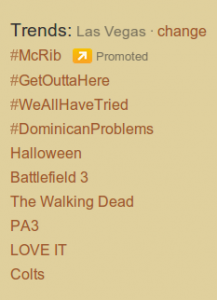 I decided to see where else #dominicanproblems was trending. 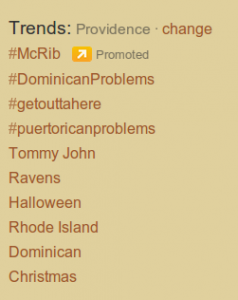 While it isn’t trending in every U.S. city it IS trending in a lot of places where there would not be high populations of Dominicans. 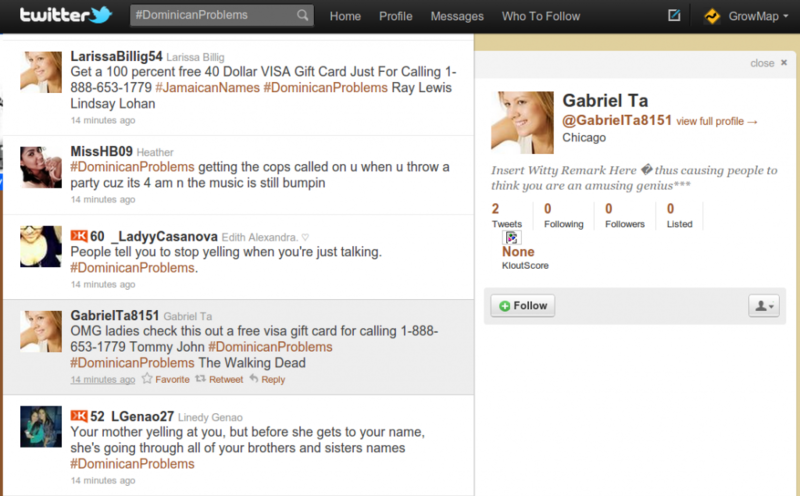 WHY are there no tweets visible in spammer’s profiles? 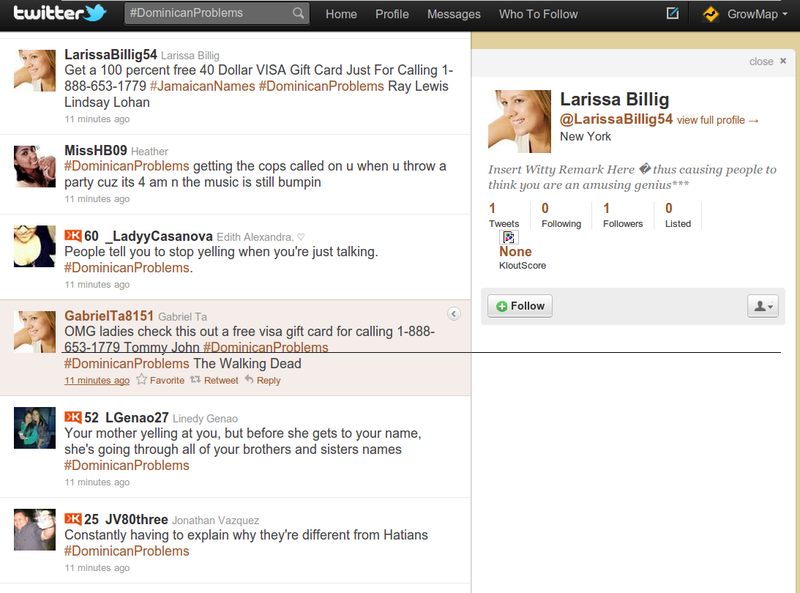 In the screen capture below you can see the spam tweet for a VISA gift card in the left side but there are no tweets in the profile at all. When a profile is full of spam tweets going to the same URL or promoting a specific offer repeatedly, people like me report them for spam. If you remove the tweets so we can’t decide whether they are spammers or not we won’t report them. up on Twitter in their profiles? Why is there no tweet visible in this spammer's profile? I did a series of sequential screen captures so you can tell I took one Twitter user after another in order. I did not jump around or selectively pick out only what I wanted you to see. 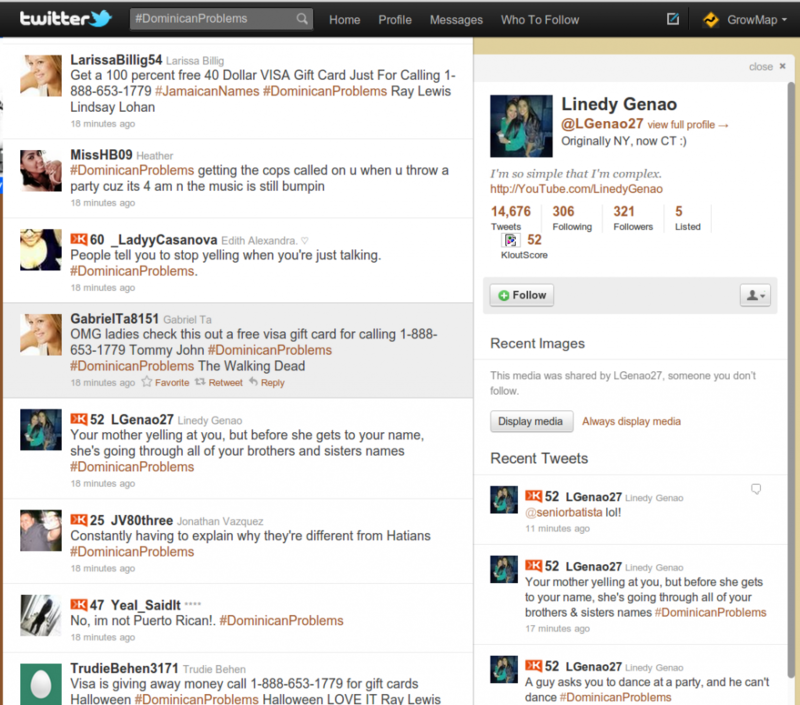 This next screen capture shows that the next tweet done by a regular user shows that she has tweets in both the left side showing the Twitter stream AND in her Twitter profile shown on the right side. While I suppose it is possible that spammers have found a way to send tweets into Twitter streams that do not appear in their profiles, it is more likely that Twitter is doing this internally as a way to generate income. That is a common problem. Try the tips in What to Do When Your Twitter Account Gets Hacked. That post explains that changing your password may not fix it – you may need to revoke access to Twitter apps. How is explained at that link. nice post! i had no idea twitter is doing stuff like that.. i don’t really understand how can they permit a thing like that..
@peter: i don’t see how twitter helps with SEO, maybe just for forcing google to index a page.. This is really shocking. How can be this happen? Is twitter actually operating such steps to generate income only? Unbelievable! They are also now using twitter for their backlinks and for SEO techniques. 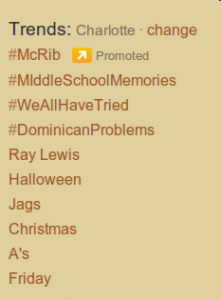 Will twitter help us from our needs of back links?For my experience, their are too many competition on social sites. hmm, good idea, worth investigating definitely. Good research! I have noticed the blank spam accounts but didn’t think much of it. Could it be that tweets stay in the search stream after being deleted, so maybe the spammer is tweeting and deleting, and the tweets stay in the search stream but don’t show on the profile? 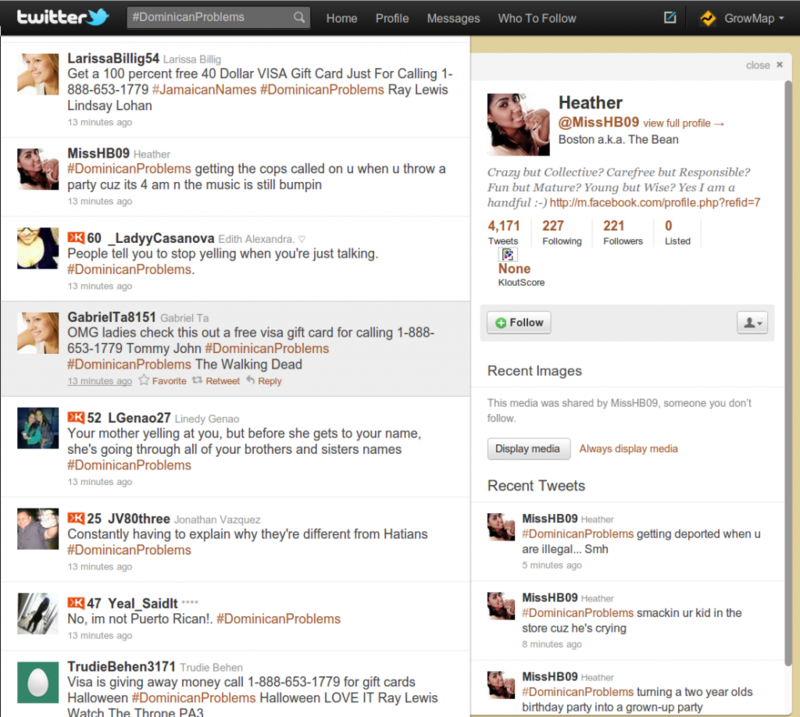 I’m really feeling a little off these days when it comes to Twitter, and now with this? I would love to cut Twitter off from my daily activities if it weren’t so useful, even with the amount of spam going in and out on the site. It is still one of the best sites to get traffic from. I do hope for the sake of all the loyal Twitter users that they can do something about this. 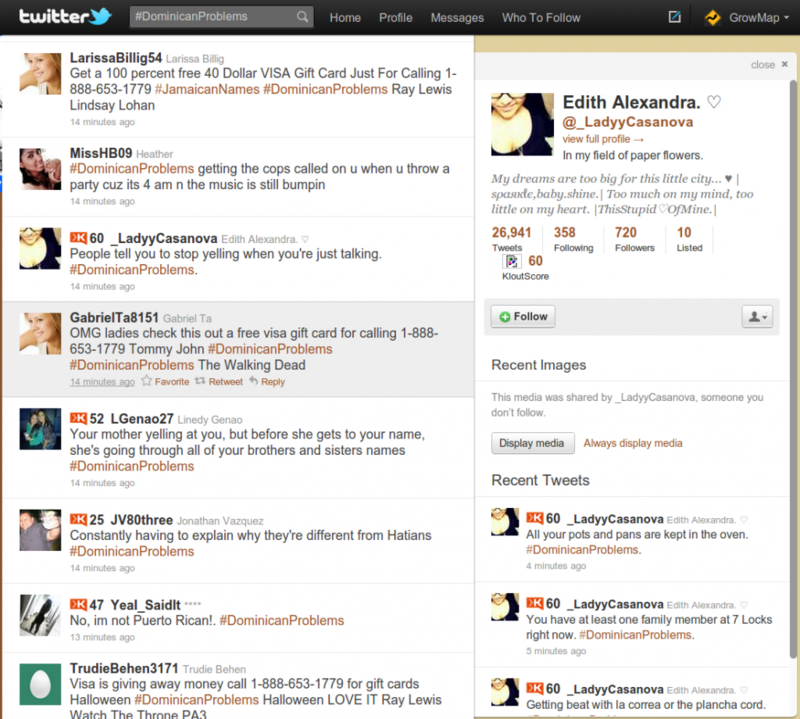 All the screen-shots that you offered above are very useful for everyone who uses Twitter! To tell you the truth I use Twitter not so often, because of spam. There are too many spammers on it, and I’m afraid to damage somehow my computer. I have found recently that spammers are including two or three trending topics within their tweet in hope of being noticed! Spammer are the hateful entities on the online world. We have never consider that they can do such a deep attack. Your research has benefited us. You have done such a great job at this screen shots. And it is very frustrating how t his spammers work since it creates chaos to the community and it ruins people who does a clean living. But I just don’t understand why do they have to do this. Social media is a very cool place to promote but this compaines just have to work it out like human beings and not make it a wrong example for others to follow. Thank you very much for the great info. I personally hate spammer accounts in twitter because it bothers me the most since I always use twitter for my business. Anyway, thanks a lot for posting this article. I think some nifty hackers got around some of the security. Time will tell. Once twitter fixed the loophole rest assured people will start selling the hack as a plug-in. Probably telling everyone you can makes thousands doing nothing, they probably add 5 useless bonuses and price it down from $997 to $97 he he. If it is twitter themselves, wow, I would be shocked. I wonder if spammers have developed scripts which can create tweets and include / inject id tags from real accounts so when they show up in the Twitter stream they look real but because they didn’t actually originate from an account they don’t show up in that account’s profile. Much like hyjacking SMTP servers to send spam email and have it look like it comes from a legal account. Twitter and Facebook have a lot of work to do when it comes to combating these spammers and this is a great example. 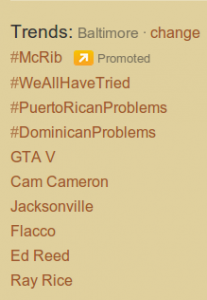 Honestly, I’ve never had much confidence or interest in Trending Topics on Twitter because a great majority of them are useless or unrelated to what I’m interested in finding on Twitter. The other day, there was a guest on my blog who introduced a new Twitter tool called Twimbow (see my CommentLuv link) that could help address this problem. 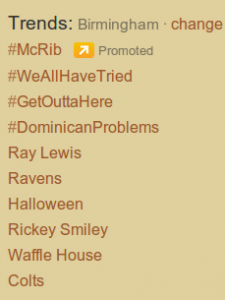 You can filter out tweets with specific hashtags and coming from networks like Foursquare for example. 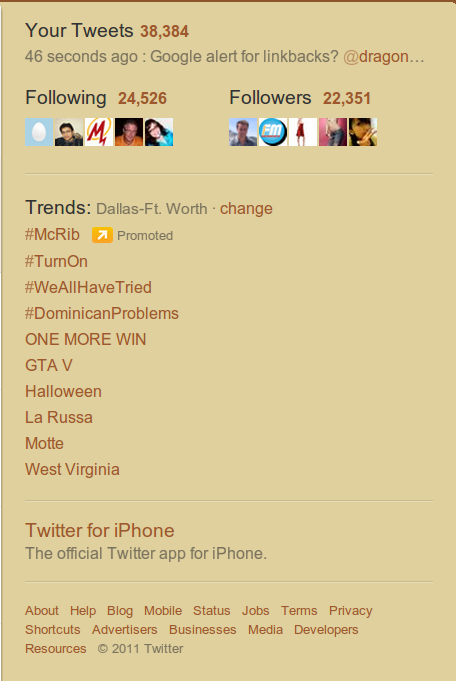 You could use Twimbow to exclude any trending topic you find suspicious, and I think it’s one of the great features of this service. Thanks for the heads up on this Gail! Yeah the amount of “people” that follow me or reply to tweets that are spam is quite annoying. Once the way the spammers are doing things is stop they will only have a new way to get around the system. Endless cycle it seems. think we have to watch this more closely now. I’m sure one of your links shows folks how to report SPAM, but it’s pretty simple (and this article has a lot of links). Just click on the suspected spammers username in your timeline (when using Twitter’s on the web program, it may look different via a third-party tool liek Tweetdeck or a mobile app). This brings up their account in the right column. If the account’s last three tweets look as suspicious as the one that made you think they were a spammer, then click the down arrow and select “report Username for spam” – it also blocks their account for you, so you don’t see their tweets anymore. This helps Twitter track these folks (or robot accounts as many of them are) and close them down faster. 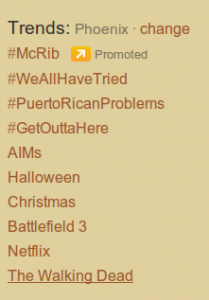 It’s even easier nowadays to SPAM Twitter, if you know how to interlink all your website/social networks. For example, WordPress now has countless plugins that are designed specifically to update Tweets real-time. Certainly a valuable resource, but very easy to use for SPAM purposes. I wouldn’t be surprised if there’s all types of hidden income generation streams that have yet to be discovered by most of the social sites. Nice find Gail, it’s certainly very suspicious. I agreed with you, Twitter is full of spammers and newbie online marketers really don’t know how to utilize twitter for marketing purpose. They just continuously tweet same tweet again and again. If you really want to utilize twitter for marketing purpose then you must find the right people who actually looking for your services or products only then you can get benefit. As far this spam is concerned, I think it’s a bug with one profile or may be twitter is just working with spammers. 😉 Twitter need to work out on such things really strongly to remove spam. I saw some sites that automatically send out some updates in different social networking sites. I’ m not yet sure of its proven success but looks like its pretty useless. Aside for the fact that these are just garbage all over the world wide web.